A few weeks ago I started something new with my class that has been working really well. As many of you do, I begin my day with morning work. My students come in and they have on their desk their morning work page for the day and the book that they are working on for fluency and accuracy. They know that they must do their page and read the book before they do anything else. That’s old. I’ve been doing that for a while. What is new is what I’ve added next. My class this year has been really struggling needs practice with their sight words and spelling words more so than classes that I have had in the past. Therefore, I have started having my students go to a literacy center as soon as they finish their morning work. They look at this pocket chart and see what center they are doing that day. Below the pocket chart I have recording sheets that go with each activity. The students need to take their page, and then go to the literacy shelf to get their activity. On this shelf students can find the box of words with the Dolch words that they are working on this week and all of the games that we will be playing that week. Each word box has the list of names of students who are using those words for the week. Inside the box are smaller baggies with the students’ names on them. Inside these baggies are the words that each student is working on. Also in that bin are our Science vocabulary words that we are working on. If students finish their center early, they may go to one of our Science themed pocket charts. These currently have our facts and opinions about spiders and our spider vocabulary words and definitions. On 9/20 this student was still working on their pre-primer list. We practiced those words that week and the next week they passed all of those words! HOORAY!! This student also attempted their first grade words that day. As you can see we only went up to the purple line and needed a lot of help. In guided reading and in small groups we practiced these words and also put them inside their baggie for the week. This week when tested, we still struggled with a few of the same words but made it through the whole list and will now focus on the underlined words. Each week I have been seeing mountains of improvement with not only my students reading abilities but also their spelling abilities. It does take some time to implement and get set up, but my students are loving the “games” and are really starting to master these words!! If you need any flashcards for the Dolch Sight Words or any games, please feel free to stop by my TpT store. I am currently selling at least four packets with games and activities to go with the pre-primer- third grade words. 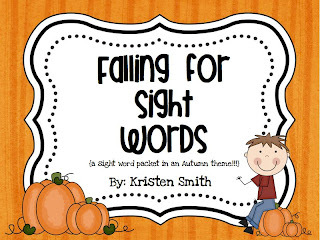 (My students currently are loving my “Fall” sets and I’ll introduce my “not so spooky” words next week!! I hope you are having a good start to your week!! Those are great activities! I’m glad your students are showing improvement. I have a 1/2 combo this year, and for the most part, my first graders are doing great! I’ll have to keep these in mind for those that need a little extra practice. Wow! What a sophisticated system you have going on there! It sure looks like it’s working! My kiddos love having their own lists and I can easily track their school and at home practice. Great POST!